Camping at Sutton Vale Country Park for the first time? Many of us have happy memories from our childhood of family camping trips full of picnics, woodland walks, fishing trips and games of rounders while the sausages cook on the camp fire. Camping, whether it be in a tent, campervan or caravan, can be unbelievably cheap and provides an escape from the all-consuming daily distractions of everyday life – no need to put on your best outfit to go out for dinner, no arguing over the TV remote but a chance to learn new skills, explore nature and spend quality time with family and friends. However, as enticing as it might seem, for many the idea of a camping trip is intimidating – will you be bored, cold or uncomfortable? How will you manage if there is no phone signal or without your hair straighteners? Here are some tips to help you take the plunge and have a trip to remember. * Something to sleep under – a tent, caravan or motorhome. Obviously the cheapest option is a tent but some prefer the slightly more luxurious option of having an actual bed and their own toilet. If you are choosing a tent, make sure it’s big enough. It’s always better to buy one designed for one or two more people than you intend to actually sleep in it (unless you are keen to be extremely snug). Remember a good sturdy hammer for the tent pegs (you may not have much luck with a tin of beans). Make sure you practise pitching the tent before you go – you need to check you don’t have a part missing and that you know what you are doing so if you arrive in the middle of a downpour it is as painless as possible. Something to sleep in – if you are sleeping under the stars remember that although it may get very warm during the day the temperature can drop drastically at night. Invest in a good sleeping bag designed for the sort of temperatures you are expecting. Don’t buy a 1 tog bag if you intend to camp in the middle of winter or a 5 tog for camping in the Sahara. Go to a camping store and get some advice. Something to sleep on – no-one wants to have a sleepless night because you just can’t get comfy. However flat the ground may seem when you are pitching your tent, it will seem very different at 2am when you feel every tiny stone jabbing in your back. An air bed or ‘Therm-a-Rest’ are essential items for an enjoyable experience. 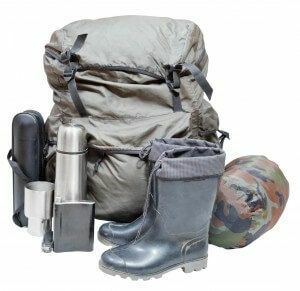 Something to light things up – you are most likely going be camping away from the bright lights of the city and after dusk it will get dark – very dark. Take something to cast some light on your camping area – headlamps are good (particularly if you are trying to fix a tent peg in the middle if the night) so are lanterns if you intend sitting up talking or singing into the night. Something to cook on – remember not all campsites allow camp fires but part of the fun is cooking in the open air. It could be a disposable barbecue or a top of the range camping stove but make sure you take something to cook your sausages and S’mores on. Things to make it a little bit easier – hand sanitizer, baby wipes, insect repellent, tin opener, camera and ear plugs (just in case!). Make a list before you go and tick it all off as you load the vehicle. The destination you choose is important. If it is your very first time you may want to choose to stay close to home where you know the area and you can even pop in to have a look at the site before the trip (or pop home if you forget something!) Think about what you need – do you want to be in the middle of the wilderness or close to amenities? Is it important that the campsite has facilities like a swimming pool or evening entertainment? Think about the time of year you want to go – it may be best to start with a summer trip so the weather has a better chance of being kinder. But be aware of when the peak times are, particularly the school holidays – if you would rather have a more peaceful break it may be better to go in term time. Book your pitch well in advance and read up on the site (especially the rules – dogs, campfires etc.). Also, do some research on the surrounding area so that you have ideas for activities before you go. Plan to arrive at your campsite in good time – you don’t want to be a novice pitching your tent in darkness. When you get there make sure you choose your pitch well. It some cases it may have been pre allocated, but if you have the choice take into consideration how close you want to be to the toilet block and any other amenities. Try to pick a location thatis level and offers some shade if needed. You may want to keep away from ponds and lakes in the summer months as still water attracts biting insects. If you can, pick a place with a view – there is nothing better than waking up and being surrounded by natural beauty as you cook your sausages. When you are sorted start to enjoy the experience. Make a cuppa on your camping kettle, unfold a chair and take in your surroundings. Take something easy to prepare for your first meal –perhaps a pre-cooked meal that needs reheating or maybe you could splash out and get fish and chips – the main thing is you need to relax. It is up to you how much or how little you do on your trip. Maybe you just want to get lost in a book or perhaps you want days filled with hikes and trips out. There is no need to spend much if you don’t want to. The campsite should have details of good local walks, nature trails, beaches and fishing locations. Take a picnic and enjoy the open space. 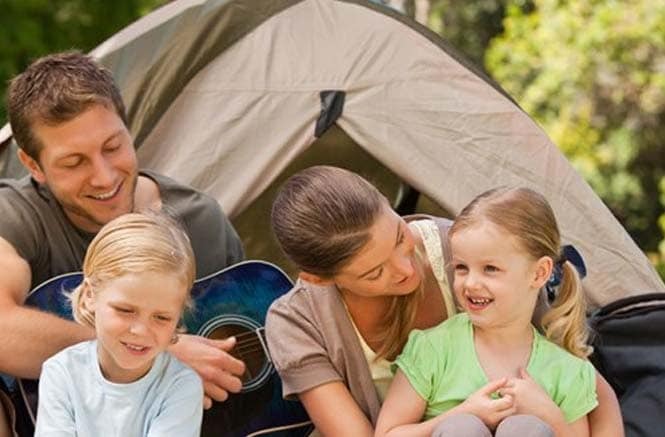 Even young children will enjoy a day spent collecting bugs and fishing for sticklebacks – teenagers, may prefer a day surfing on a local beach or playing cricket or rounders with other campers. Make a plan of what to do in bad weather. Board games will only maintain interest for so long (although they are worth taking). Think of some activities for after dark too – a guitar and a sing-a-long, stargazing or just talking and catching up with loved ones. Many people purposely ‘ban’ electrical items during camping trips but you might want to take something for ‘emergencies’. A couple of nights is probably about right for your first outdoor trip. Not too daunting but enough to give you a taster so that you can test your equipment and learn about the sort of camper you are. 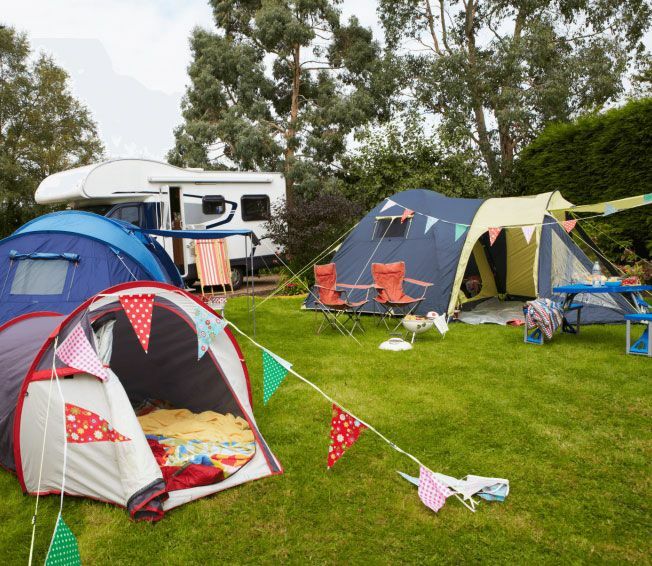 When you arrive home, review your trip – could you have done with any additional equipment or would a different type of campsite be better next time? Hopefully you will decide that it was only the start of many happy camping trips to come.